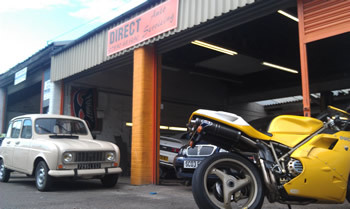 Welcome to Auto Servicing a garage in Exmouth that has been established for over 7 years. We are reliable mechanics with over 20 years industry experience. We value all our customers and can be depended upon for quick and effective diagnostics for keeping your vehicle on the road using the most up to date digital diagnotic tools. Exmouth Garage Services can work on all makes and models of car or vans. We pride ourselves on our reputation and customer satisfaction. We do offer local recovery in and around Exmouth so store our telephone number on your mobile: 07890 481 490 – if possible we’ll always assist. If we can’t fix your vehicle on the roadside then we’ll tow it back to our garage and provide you with a detailed quote. If you are looking for a pre-MOT we can facilitate this so you can get an idea of the level work required to get your vehicle through it’s MOT. Our MOT service is exceptional as we don’t charge for a second MOT unless there’s major work involved. Via arrangement and a small additional cost we can even pick up and drop off your car or van. We are quite a large garage having two working bays to accommodate vehicles. We have a 2 poster vehicle lift so we can gain good access to all the working parts. If all you want is your engine fault code read then we can provide this services as well. If your EML (Engine Management Light) is flashing on and off or if it’s on solidly we have tools to read your engine fault codes so you can make a decision if to fix yourself or not. We also have a tyre fitting tool so we can either repair or change your tyre accordingly. We have heavy duty welding equipment which can be mobile as we don’t only weld cars and vans but any type of metal joint. We have many years of industrial welding so contact us for a quote on any job.